Merezhka. The openwork can be made of different drawing, but only under direct direction yarns of the fabrics. It is best to do a hemstitch on linen fabrics, as their warp and weft of the same thickness. The latter is particularly important when the openwork doing in both directions, as different thickness of the threads the place of their crossing will be weak. For making frayed fabric of stretched filament. After pulling the first thread, the others are pulled easily. The number of strands depends on the desired width of heirloom. On a thick fabric usually makes a wide hemstitch. For this thread I think, grasping a needle. On thin fabrics it is necessary to do by eye. A simple hemstitch shown in figure 259 on top, double hemstitch on the bottom. Several one above the other rows of heirloom produce the impression of one wide. For this one zigzag stitch is captured from two rows (Fig. 260). You can grab the edge with a few stitches or bunches of threads. In figures 261 and 262 shows a more complex meriahnya seams. Complicated heirloom are combinations of different weave fabrics working with thread. For the manufacture of, for example, the frayed punk pulled out two sets of threads one above the other. Fasten the working thread and cover it with stripes of fabric between the rows from the bottom up. Then thread on the wrong side lead down to the right, diagonally upward output. Then, pulling the spider on the bottom row, are once again on the wrong side. Passing diagonally up, the thread goes on the front side and the stock group of threads of the top row, goes on the left side to the left. Again bringing it inside out, aiming diagonally down.The working thread is repeated (Fig. 263). How to transfer embroidery pattern. Doing this usually by using carbon paper, but if the fabric is bright and clear, the picture is placed under it, attach a thin round pins and a sharpened pencil. If the fabric is thick or you can't use carbon paper, proceed as follows. Putting a figure on a soft surface, doing it the contours of frequent punctures with a thick needle. Then the pattern is applied to the cloth and wipe it with a cotton swab with powder or chalk. Fabric will mark, which you need a pencil to circle or prometti frequent stitches. Sometimes it is necessary to increase the size of the picture. For this purpose it is divided into smaller cells of the same size. The same number of cells, but larger, rezinovyh a sheet of paper and in each square exactly reproduce what is drawn in the corresponding small square (Fig. 264). Reduce the figure on the same principle, only paper rezinovyh on cells smaller than the cells of the figure. Lace needle. If the old product has many embossed lines and details do not allow you to carve out the entire detail of a new product, to connect the individual parts you can use the embroidered lace. 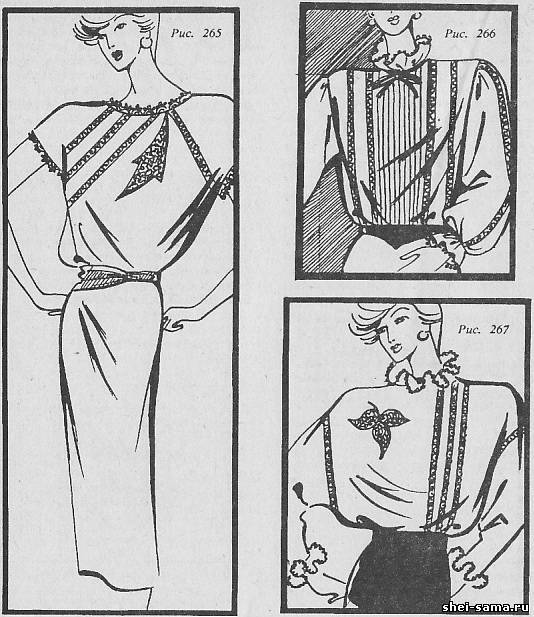 Thus it is possible to perform a dressy blouse from silk, fine wool, cotton or linen fabric. It is important that the joints were reasonably justified in the composition of the product and served as a decoration (Fig. 265, 266, 267). Jumper lace not depend on the material and the direction of the threads. This is his advantage and the ability to connect different tissues during the upgrade.Due to the excessive complexity of embroidered lace to update therefore it is recommended that only products made of expensive and beautiful fabrics for a new product can be used in a particularly festive atmosphere. Embroidered with lace - a kind of embroidery, so is a manual sewing needle, stitches, characteristic embroidery. It has developed from heirloom. The fabric has pulled threads of weft and warp, leaving a sparse group of filaments, bonded or interlaced twining round stitches. On free surfaces, embroidered in geometric patterns. Gradually the tissue structure does no longer pay attention. Was enough for a needle and thread. The pattern attached to the dense material, the auxiliary pulled thread and embroidered in between the lace motifs.At the end of work cut basting stitches of the support, and separated from the finished lace. This principle can be used to connect two parts with a pre-treated slices. Now embroidered with lace made of fine linen thread. Modern fashion allows the use of different threads, including thicker. And to master this art when a thick thread is easier. The needle should be long, lug to fit the thickness of thread. The beauty of embroidered lace depends on the pattern and skills of the embroiderers. To connect the lace parts cut their pre-bends and namachivajut tight stitches around the edge to folded in half linen canvas. All lace stitches free, do not touch the base material. Threads attached to the edges of the parts, indicating a contour line of lace. They also are fastened and the ends of the embroidery thread. Stitches embroidered lace similar. Different only by their location and combination. Simple lace stitches similar to frayed and bride. To obtain bride the rods over the edge (Fig. 268) the thread is stretched from edge to edge and back, wrap around stitches to make a breed similar to the lace. The transition from one to the other bride is at the bend of the connected fabrics stitches over the edge. To brida was more durable, the edge-to-edge pull three strings. They entwine or overcast stitch seam (Fig. 269, 270). 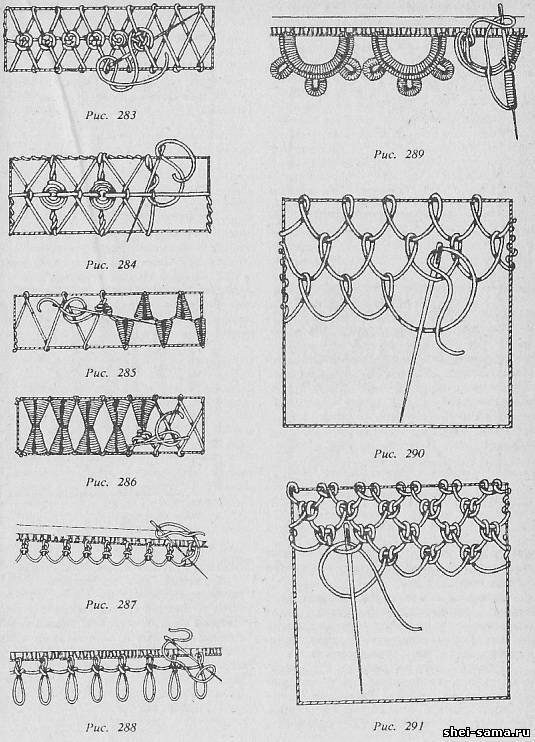 Lace seam figure 271 consists of brides with looped Picot stitches. This breed performed as follows: from one edge to the other pull three strands and, returning, filled the looped stitches to the middle, then from the thread make a loop and fix with a pin. Summing up the needle under the connecting thread Picot stitch fix stitch. Bride figure 272 embroider similar to the previous one, but Pico consolidate the two looped stitches. 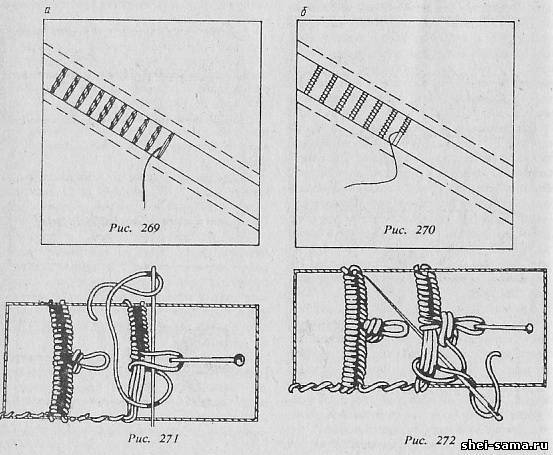 To perform bride looped stitches with a spiral Pico (Fig. 273) top loop of the last stitch in the row is wound on the needle from left to right 10-12 times. Holding the turns of the thumb and forefinger of the left hand, withdraw the needle under the thread loop stitch; a thread to delay until the spiral Pico does not lie tight to the edge bride. Then finish the embroidery. When you run bride with two rows of buttonhole stitches (Fig. 274) on two or three main threads embroidered one-sided range of double looped stitch intervals such that they could accommodate a second row of double looped stitches. The progress of the embroidery stitch double stitch: the first row of stitches embroidered usually the needle is directed downwards, the second number is embroidered opposite - the needle is directed upward. Simple Russian bead (Fig. 275) is formed of looped stitches in a zigzag pattern with equal intervals between the two edges of the connected parts. Stitches one edge be in the middle of the gaps between the stitches of the other edge. In a twisted Russian stitch (Fig. 276) in contrast to the previous needle appears in front of the thread and the thread winds around it once. When embroidering the seam with double-sided spiral (Fig. 277) bottom lace embroidered plain Russian stitch, and at the top of the stitch wrap the thread three times. For the manufacture of prosby with simple hinges (Fig. 278) at opposite ends of looped stitches make the weak, shifted relative to one another. 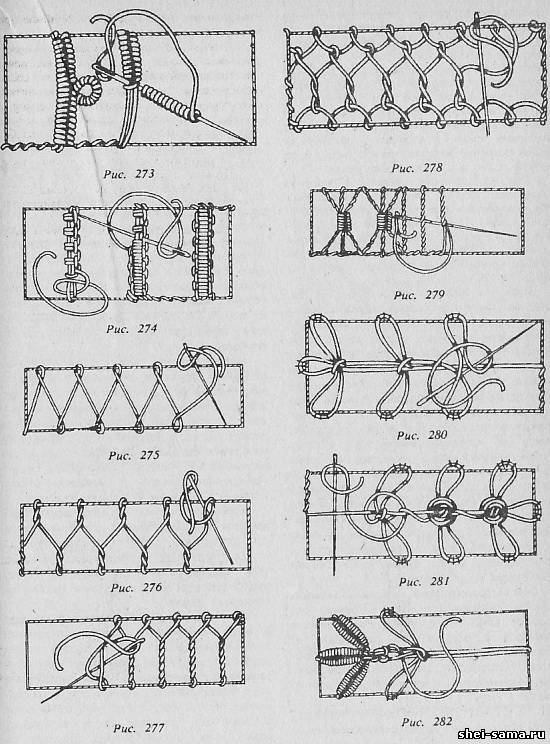 Then the arc of the loops and connect the looped stitches in two ways: in the upper part, as in figure 275, in the lower figure 276. Provu with bunches of looped stitches (Fig. 279) is performed as follows; one incomplete and two complete simple bridi stitches over the edge (with small gaps between them) connect five or six buttonhole stitches in the same group, then finish incomplete breed. Extreme Brady groups are located closely. To complete provu with a simple motive twig (Fig. 280) along the surface of the embroidery is carried out from the middle line up from the bottom of the embroidery thread and the top edge of the capture needle two threads of the fabric; then the left-hand side up and right side down on top take the needle through two threads of the fabric. Connect the formed loop on the middle line bundle. Prosa with motifs twig and spiders (Fig. 281) embroidered as the previous one, but sealed with the knot in place is complemented by the motif of the spider. Embroidery prosby with the motive sprig of twisted leaves (Fig. 282) along the surface in the midline from the top down to navigate the thread. Taking a couple threads on the far bottom edge, hold the thread back on the top edge. Make loops for the leaves that are associated with knots, as for the previous two prosv. Then hold the thread back up to the starting point and embroider the interlacing stitches of the upper middle piece of the. Lateral leaflets also start to embroider from the top, so on one half of the leaf is one, while the other two support threads. In the manufacture of prosby with a motif of small spiders (Fig. 283) are two intersecting series of simple Russian stitch. The thread is up to half the width of prosby, at the point of crossing of the threads is about five stitches Spidey. 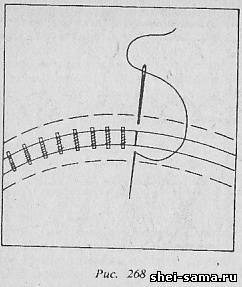 A needle is carried further down to the next crossing thread. Provu with a motif of large spiders (Fig. 284) operates as follows: pull the thread along the middle line, embroider the surface from top to bottom, then stitches are over the edge to the corner and form between the two corners of the outside loop. Then stitches over the edge of the conducting leg of the angle is half of the width of prosby. The needle is put on top of the previous loop and below the horizontally stretched thread, fasten the thread to the opposite edge. Now give the thread back to the starting point on the other side of prosby. Make back one revolution around the thread.At the point of intersection with the horizontal line form around four threads the motif of a large spider. Embroidery thread now carried out a revolution around the vertical thread to the edge of prosby where do new outside loop. The basis of making prosby with pyramid motif (Fig. 285) - a rare number of Russian joint. The intertwining of the triangles start at the top and embroidered to half of the width of prosby. The transition to the apex of the next pyramid takes place in several turns around the threads of the main seam. Figure 28B intertwined triangles formed by two intersecting ranks of the Russian joint connecting the tops. Doing lace for the edges, use different combinations of looped stitches. Lace edge with knots of buttonhole stitches (Fig. 287) is performed as follows: a thread attached to the edge of fabric in the usual knot, close to the previous knot around the end of the free thread and the thread coming from the needle embroidered stitch stitch knot. End free threads run in the fabric (in some cases in nodules). On the right of the previous knot distance form the embroidery thread a small arc and attach it to the fabric similar to the combination of the first knot.The formation of loops for the lace edge with Picot (Fig. 288) and tying knots in the string must be held between thumb and forefinger. Lace edge with arcs of the looped stitches and spiral Pico (Fig. 289) made on samples in figures 270 and 273. Embroidered lace can be not only linear, but can fill various shapes of the surface. This option can be used to design lace tissue having a defect: cuts, spots, places in the old location Welt pockets, etc. the location of the plots, filled with lace, you need to link with the idea of product style and its overall design. Items embroidered lace can be inscribed in a rectangular or more complex shape: round, flower petals, etc. Form lace stitches outline the contours of the figure. Attach the thread to the auxiliary thread on the contour lines. The figures shown 290-295 lace rectangular shape. On the rectangular surfaces is necessary to observe the uniformity of the pattern and number of stitches. To extend the surface of the number of stitches to the edge increases, contraction decreases. To avoid piercing the thread of previous stitches, embroider often, keeping the needle eye forward. The transition from one row of stitches to another is done through the pre-serged stitches the outline of the pattern. Lace seam figure 290 embroider rows (forward and back) free rare buttonhole stitches. The stitches in each successive row are placed in the loops of the previous one. This is the simplest stitch tulle. 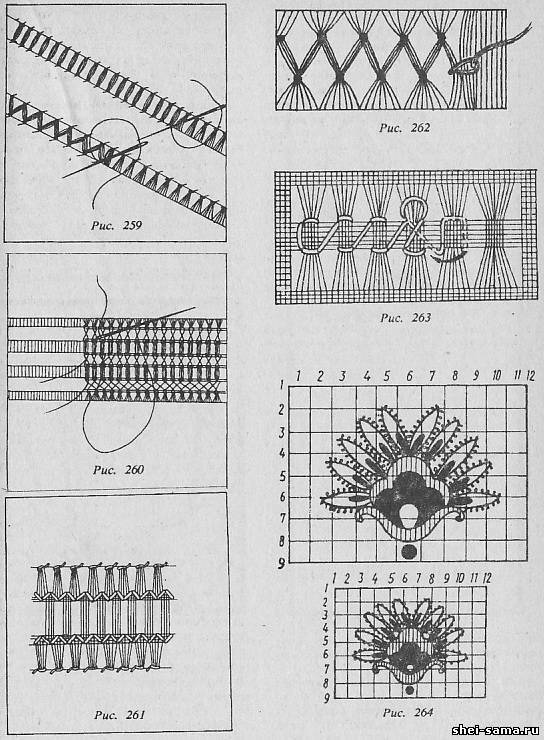 Lace seam figure 291 perform rows (forward or backward) of the groups of double looped stitches. The distance between the groups of stitches a little more than their width. 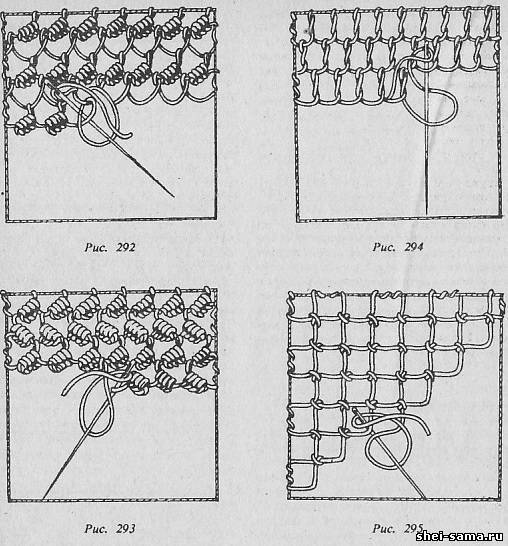 The group of stitches each successive number is within the loops of the previous row. Used when embroidering thick tulle. Lace the seam on drawings, 292, 293 it is recommended to start close to rare buttonhole stitches from right to left (in the picture - second row). Back a number of stitches starting 0.5 cm below the previous one and doing a loop of the previous row and one loop stitch around the newly formed loop embroider on two thread from left to right four or five buttonhole stitches. Embroider the third row as the first, the fourth like the second etc. Forward-backward twisted buttonhole stitch embroider lace seam figure 294. The thread forming the loop, hold the thumb of the left hand, the needle is directed from above through the loop of the previous row and padded thread-loop. Embroidering right to left, the thread loop will form on the contrary. Formed of stitches bride should be placed vertically. The breed can do the usual looped stitch, twisting it as one more stitch. Lace seam figure 295 starts one loop from one corner and embroidered diagonal rows back and forth. All ranks are held together with loops of the previous nodules. The length of the loop is adjustable with a pin. This seam is a common grid and can often be used in the design of fashion products. By filling in the planned area of the lace stitches, the outline of the picture overcast stitch seam. The excess tissue is trimmed. Lace iron inside out using a damp cloth on his soft bed.